Johnny Cash‘s legacy may have been set in stone by the Phoenix-Witherspoon biopic, Walk The Line, but the cartoonish representation of his early career does a good job of skewing the events of the legend’s life. In truth, Johnny became such a devout Christian that he abandoned many of the traits that made him a commercial success. He was dropped from his record label, and seemed intent on living out the rest of his life with his wife in Tennessee. 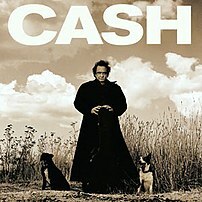 But his December years were spent under the umbrella of Rick Rubin‘s American Recordings label, and with Rick at the helm, Johnny recorded some of his finest material to date. From 1994 until his death in 2003, Johnny recorded a boatload of material, and, to date, his label has released American Recordings (1994), Unchained (1996), American III: Solitary Man (2000), American IV: The Man Comes Around (2002), Unearthed (2003), American V: A Hundred Highways (2006), and, reportedly American VI is due in 2009. I’ve never heard of drop.io. What is drop.io?